Burke Mountain in northern Vermont brought Small Mammal in to overcome low awareness, years of disjointed creative and misconceptions about the mountain’s size and proximity. In addition, competitors (big and small) had added amenity after amenity over the last 20 years while Burke had remained basically the same. Turn that perceived negative into a positive and position Burke Mountain as the last bastion of all that made Vermont skiing so great in the first place. 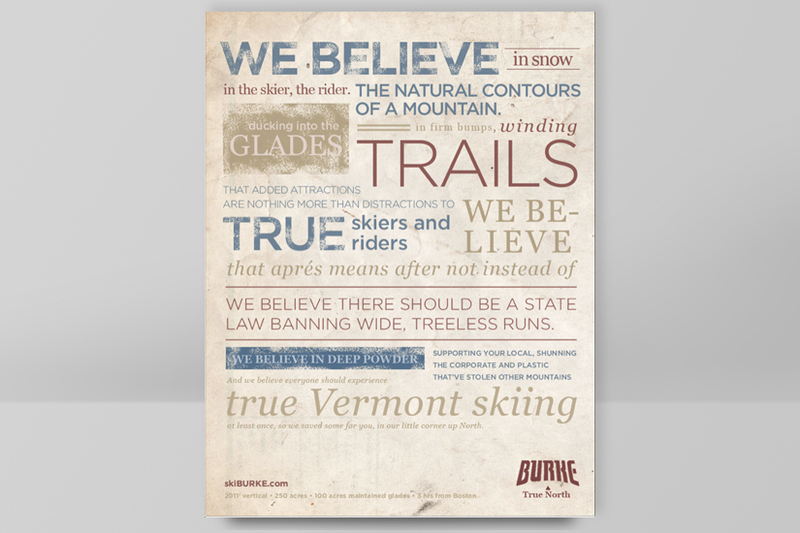 A mountain for true skiers and riders–Burke True North. Swapping out multiple small-space insertions in local papers for full-pages in key publications, the print announced to true skiers and riders that Burke shared their worldview. Digital boards just outside Boston allowed for multiple impressions in the closest major market with minor media dollars. Messages changed, literally, with the weather and delivered snow specific, proximity or brand information. Trail maps, brochures, wayfaring signage–everything was overhauled to tie together and fit the True North brand. Even the holders for those signs and brochures went from un-Vermont plexiglass to chainsawed-in-Vermont wooden stands. 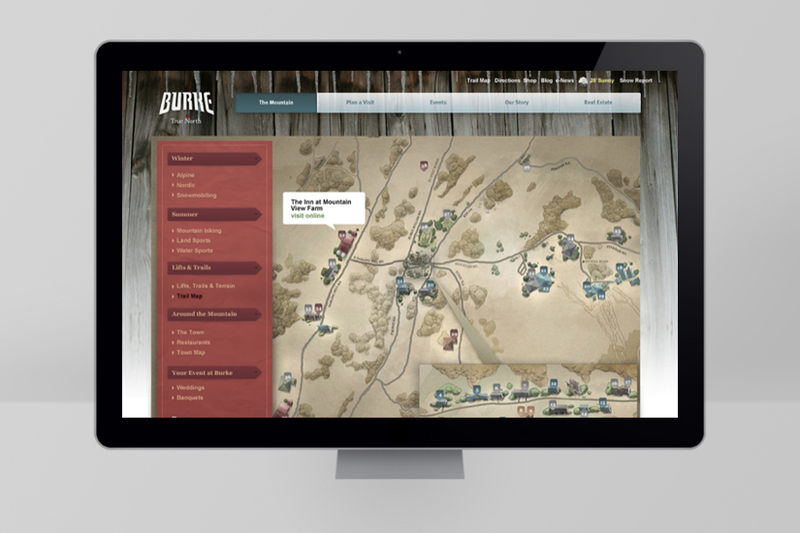 A new, completely customizable site was built with interactive trail map and the information skiers wanted most–weather, conditions, events, etc. front and center on the homepage. Secondary pages became an information center for the mountain, the town and the surrounding area, giving the uneducated a sense of how much the community had to offer. Burke won its first ever NSAA Marketing Award, site traffic was up 25% in Boston metro and the mountain enjoyed its busiest day in 7 years in the snowless 2011-12 season.